The supremacy of petrol and diesel vehicles, which until only five years ago seemed assured for the foreseeable future, is now very clearly on the wane. Four significant forces are now shifting history away from the internal combustion engine: air pollution, greenhouse gas emissions, the rapidly decreasing cost of electric vehicles (EVs) and the growing prevalence of charging infrastructure. 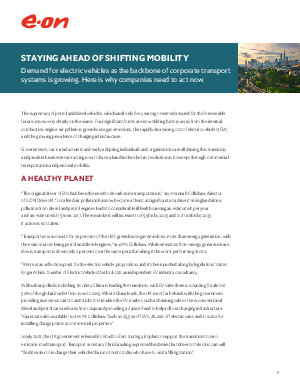 Demand for electric vehicles as the backbone of corporate transport systems is growing. Read this article to learn why companies need to act now.